Place the harissa, paprika, tahini, garlic, salt and pepper in a bowl and mix to combine. Add the beef and toss to coat. Cover and refrigerate for 20 minutes to marinate. Preheat a char-grill pan or barbecue to high heat. To make the spicy tahini sauce, place the yoghurt, tahini, harissa and salt in a bowl and stir to combine. Thread 2 pieces of beef onto 2 metal skewers. Repeat with the remaining beef. 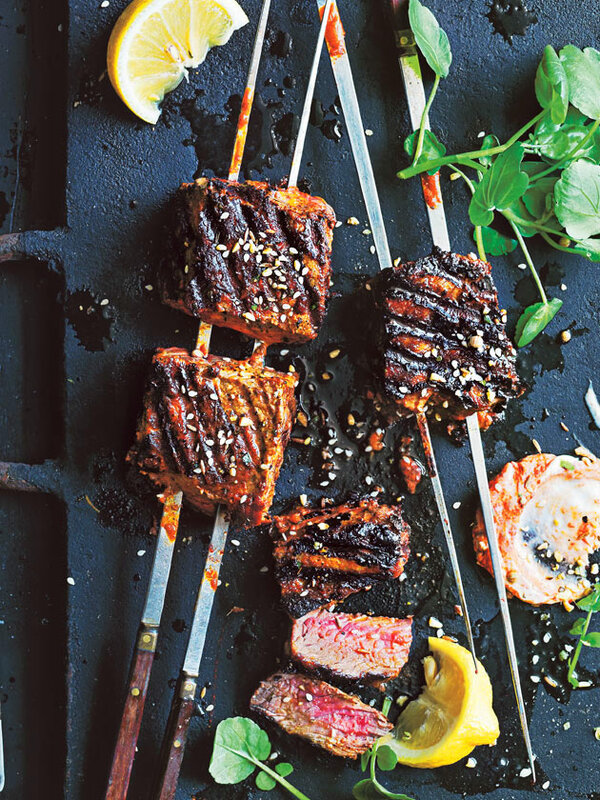 Brush the grill with the oil and cook the beef skewers for 10 minutes, turning, for medium-rare or until cooked to your liking. Serve the skewers with the tahini sauce, dukkah, watercress and lemon wedges. Serves 4.